Remember this vintage top? I was missing that one border and it needed it. So I asked on IG if anyone had something that might work. A Good Samaritan answered my call all the way from Australia! She sent me some repro fabric of this same print! You can tell the new piece is on the right, it is much brighter. I’m totally okay with that. It adds to the story that this was begun many, many years ago and will be finished soon. I did end up taking the top apart. There were lots of pleats in the long sashing pieces and I decided to fix that before quilting. 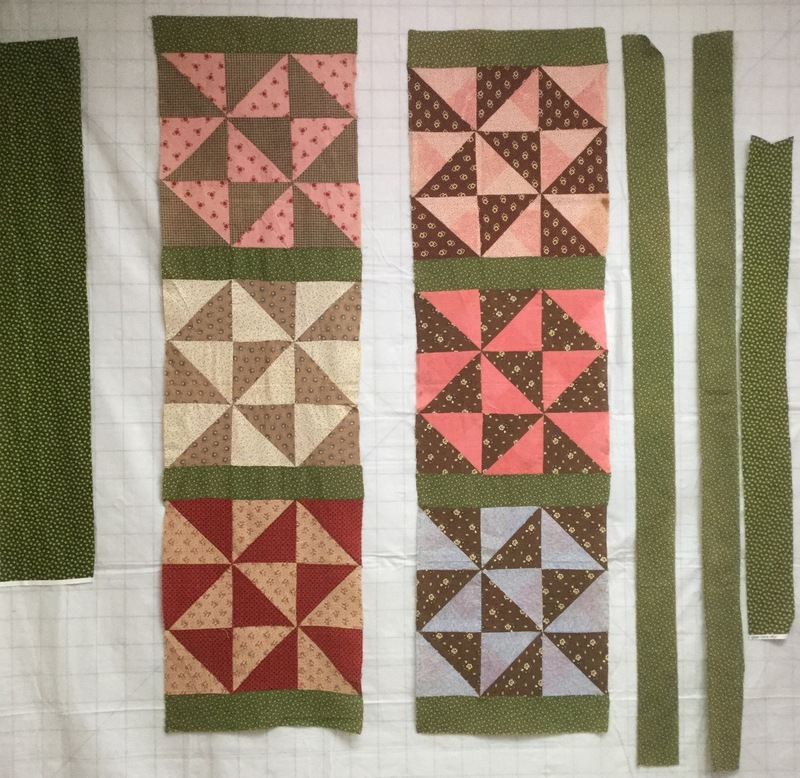 After I took it apart, I placed the sashing on top of the two strips of blocks and found that it was nearly two inches longer and all that extra had been not so successfully eased in! No wonder it had pleats! There are some interesting marks on this top, as though some pieces bled while the top was stored. It adds character! I hope to get the top back together today. I may take this to Arizona with me to hand quilt if I get the other one I’m working on done. 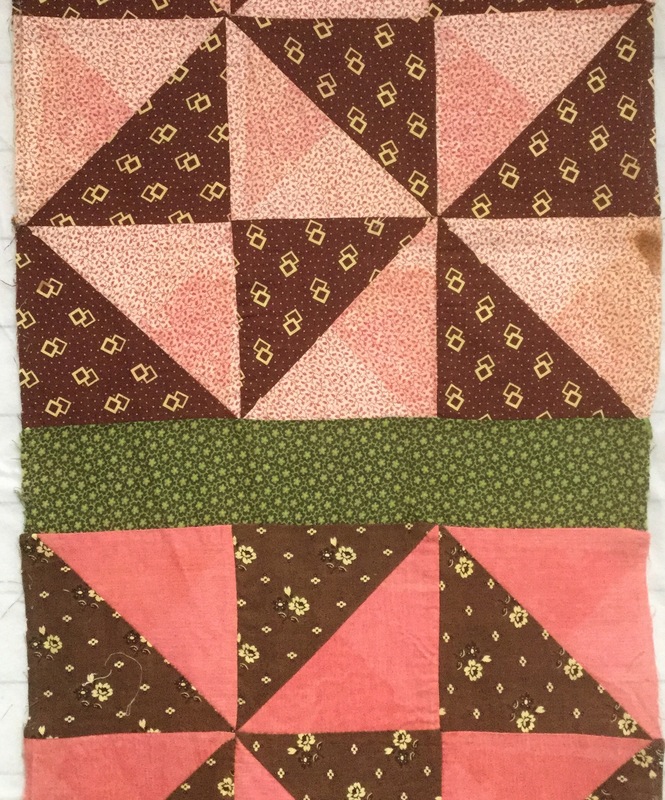 This entry was posted in Baby Quilts, Vintage Fabrics, Vintage Quilts. Bookmark the permalink. What a sweet lady to send it, and how great to find some. I could have helped out about 40 years ago. 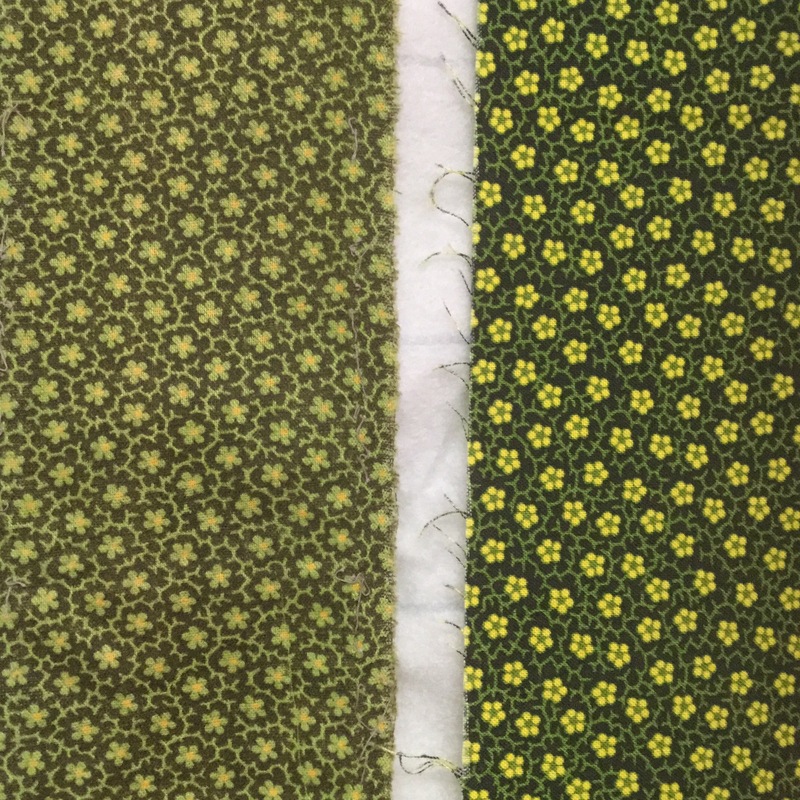 LOL That was one of the fabrics in my early stash. It’s going to be a lot better when you finish it than it would have been. That’s a great job. 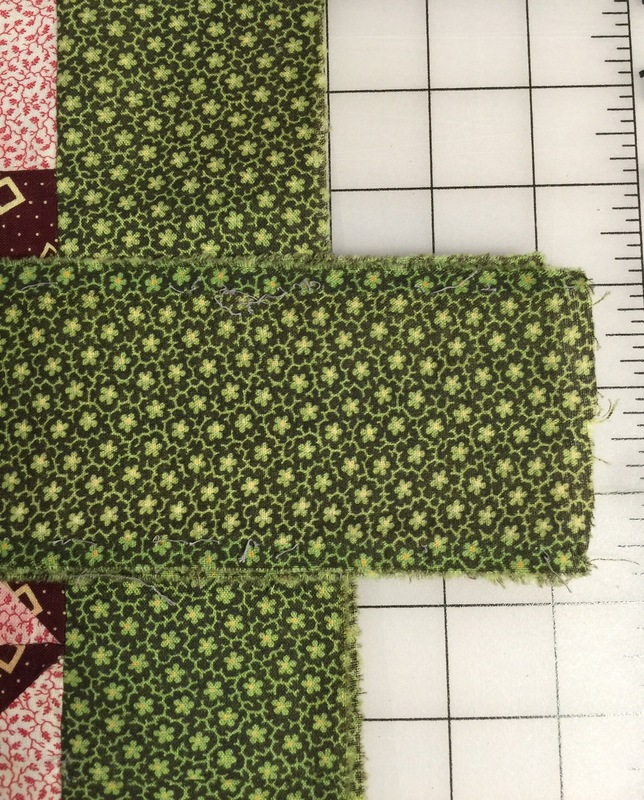 I do occasionally see pieces of fabric in others’ quilts that I know I have in my stash. We do have good things here down under – so glad someone was able to help you. What a great project. 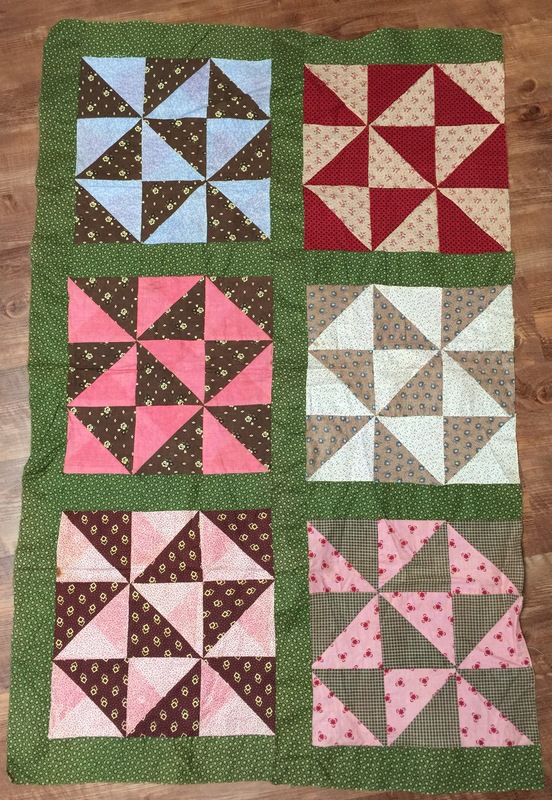 I have had a few occasions where I was tasked with repairing or salvaging an old quilt. They really have character, and it’s fun to feel yourself becoming a part of something historic. You have done a really nice job with this. Thanks for sharing. You are awesome. Can’t wait to see it done! That little quilt already had a ton of history. Now it has a good story too. How fantastic that someone in Australia had a fabric that matched your vintage piece. That’s some luck, I tell ya!! Looking forward to seeing it at its completion. Kudos to you for the rescue. Can’t wait to see it when it’s all back together and quilted. You get the Quilt Rescue Crown award — and extra points for authenticity to get the right sashing. Your top is lovely btw!